To those who see aright, this vast and mysterious universe is packed with deep joy. Its stars throb with joy, its radiations hum with it, its dark or glowing nebula embed it. The dances of the atoms and galaxies are dances of joy. Here below, joy lies hidden deep down at the hearts of all things---of boulders, trees, sharks and ourselves. 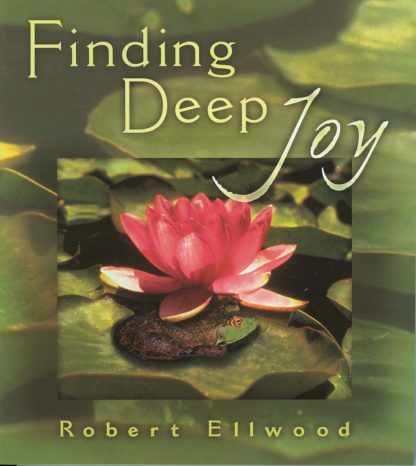 So says eminent Theosophist Robert Ellwood, who sees the joy pervading the universe as accessible to everyone, not just mystics and saints. Joy can enhance the happiest of circumstances and ease the most adverse. It is our birthright and true nature. Humph! Not mine, you say? Ellwood frankly acknowledges our shifting moods, life's tedium, and the reality of pain and despair. But he invokes Christian, Buddhist, Hindu, and Sufi wisdom to affirm joy despite all conditions---for richer of poorer, in sickness and in health. Then he leads us to find deep joy for ourselves, one precious moment at a time. At once simple and profound, this warm, gentle book is one you will cherish for yourself and as a gift for old friends, young people seeking vision, and any loved one in need. This new edition includes inspiring sidebar quotations and stunning photography to quicken our perception of deep joy in ourselves and at the heart of the natural world.